Our gas cylinder wrench is ergonomically designed to fit in your hand and provides just the right amount of leverage to properly tighten those pesky gas plugs. Each gas wrench is made from 6061-T6 aluminum and hard annodized and comes with a vinyl handle. 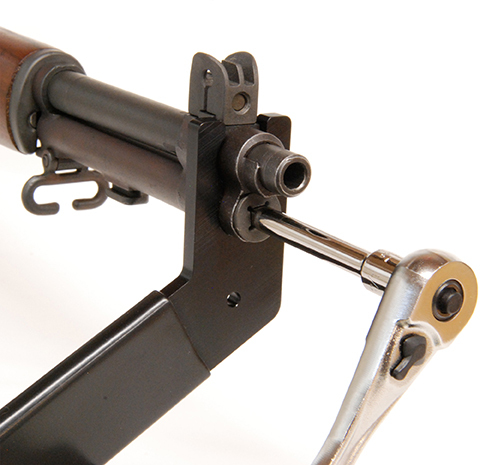 Using a gas wrench prevents damage to the barrel splines which decreases accuracy. How to use this Product.Slide the wrench over the end of barrel and gas cylinder lock. Hold the wrench and install the gas plug. Pro TipTorquing gas plug's to 10-15 FT-Lbs prevents them from coming loose during firing.